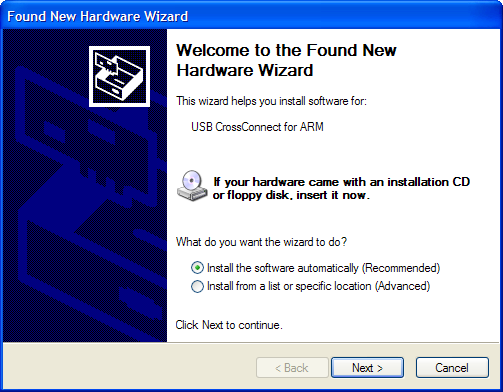 This section contains instructions for installing your CrossConnect for ARM hardware under Windows. Put the CrossConnect for ARM installation disk into the drive. Attach the CrossConnect's USB connector to your PC, upon successful connection the power LED will illuminate and Windows will prompt you that it has found new hardware. From the Found New Hardware Wizard select Install the software automatically and then click Next. Windows will now install the CrossConnect for ARM software. When the installation is complete you will be prompted. Click Finish to close the wizard. Download and unzip the CrossConnect for ARM software. 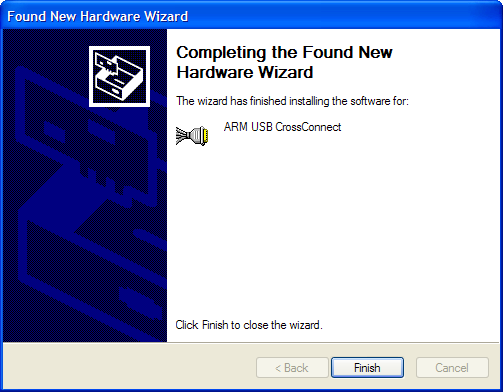 From the Found New Hardware Wizard select Install from a list or specific location and then click Next. 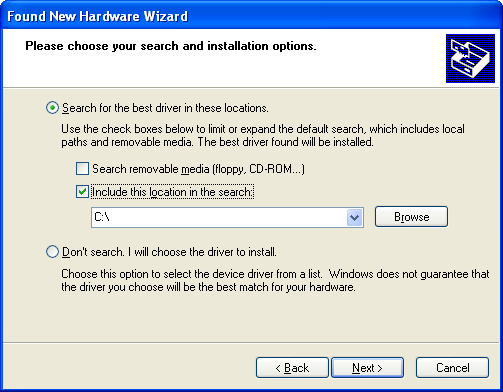 Select Search for the best driver in these locations, check the Include this location in the search option, select the directory that you unzipped the CrossConnect for ARM software into using Browse and then click Next. This section contains instructions for installing your CrossConnect for ARM hardware under Linux. As libusb is used to communicate with the CrossConnect, no additional driver installation is required. If you need to install libusb, download the latest version from http://libusb.sourceforge.net and install it into the /lib directory. Regular users generally do not by default have USB access permission. Accessing a USB device with insufficient access permission usually results in a Cannot set USB configuration or Cannot claim USB interface error message when using CrossWorks. Depending on which Linux distribution you use, there are a number of different ways of granting regular users USB access permission. Consult the USB documentation for your specific Linux distribution for more information. Why am I getting a 'The RTCK signal is not responding, disable "Active Clocking" mode' error message? When active clocking mode is enabled some initial checks are made to ensure that the RTCK signal tracks the TCK signal. You will get this message when the RTCK signal has failed to match the TCK signal within a one second timeout period. This means that the target does not support active clocking and you should disable it by setting the Adaptive Clocking target property to No. Why am I getting a 'Target not responding message'? Incorrect ARM debug interface type - Check that the Target | ARM Debug Interface project property matches the type of target you are trying to connect to. JTAG clock frequency too high for target - Reduce the JTAG clock frequency by increasing the JTAG Clock Divider target property or enabling active clocking by setting the Adaptive Clocking target property to Yes. What do I have to do to achieve maximum download speed? Disable JTAG clock division by setting the JTAG Clock Divider target property to None. Disable adaptive clocking by setting the Adaptive Clocking target property to No. Why do I get a "CrossConnect not running ARM version of firmware" error message when I connect? You will get this error message if you are using a version of CrossWorks for ARM prior to 1.5. Make sure you are using CrossWorks for ARM 1.5 or later.